Background: Non-communicable diseases (NCDs), are associated with significant economic and psycho-social burden on sufferers. Objective: To compare the economic burden of disease management on adults with NCDs and control subjects in Ogbomoso, Nigeria. Method: A total of 322 participants consisting of 165 adults with at least one of two NCDs - hypertension and diabetes mellitus- and 157 controls (without NCDs) were recruited by stratified random sampling method. The participants were evaluated for the economic burden and psycho-social implications of NCDs on them and on their households. Results: The presence of NCDs was associated with significantly higher psycho-social implication on the subjects including poorer patient-reported personal health assessment, higher frequency of hospital visits and longer average total hours of hospital visits compared to the controls. A significant proportion of subjects with NCDs depended on family supports for their hospital bills (32.7% vs. 7.6%). The total average monthly health expenditure among subjects with NCDs was significantly higher. Catastrophic health expenditure was found in 12.1% of subjects with NCDs who indicated their hospital bills were far higher than their total monthly wages. Conclusion: The management of NCDs is associated with significantly higher psycho-social and economic impact on affected individuals. There is a need for appropriate health insurance scheme and health system financing programs to reduce economic and psycho-social burdens, minimise long-term complications and improve quality of life. 1. Kengne AP, June-Rose McHiza Z, Amoah AG, Mbanya JC. Cardiovascular diseases and diabetes as economic and developmental challenges in Africa. Prog Cardiovasc Dis 2013; 56(3): 302-13. 2. Health Reform Foundation of Nigeria (HERFON). Diabetes to top cause of death in 2015. Available at www.vanguardngr.com/2011/10/diabetes-to-top-cause-of-death-in-2015-healthgroup. Accessed 15th December 2017. 3. Remais JV, Zeng G, Li G, Tian L, Engelgau MM. Convergence of non-communicable and infectious diseases in low- and middle-income countries. Int J Epidemiol 2013; 42(1): 221-7. 4. Ekpenyong CE, Udokang NE, Akpang EE, Samson TK. Double burden, non-communicable diseases and risk factors evaluation in sub-Saharan Africa: The Nigerian Experience. Eur J Sustainable Dev 2012; 1(2): 249-70. 5. Miranda JJ, Kinra S, Casas JP, Davey Smith G, Ebrahim S. Non-communicable diseases in low- and middle-income countries: context, determinants and health policy. Trop Med Int Health 2008; 13(10): 1225-34. 6. Kankeu HT, Saksena P, Hu Ke, Evans DB. The financial burden from non- communicable diseases in low and middle- income countries: a literature review. Health Res Policy Systems 2013; 11: 31. DOI: 10.1186/1478-4505-11-31. 7. McIntyre D, Thiede M, Dahlgren G, Whitehead M. What are the economic consequences for households of illness and of paying for health care in low- and middle-income country contexts? Soc Sci Med 2006; 62: 858–65. 8. Engelgau M, Rosenhouse S, El-Saharty S, Mahal A. The economic effect of non-communicable diseases on households and nations: a review of existing evidence. J Health Comm 2011; 16: 75–81. 9. Onoka CA, Hanson K, Hanefeld J. Towards universal coverage: a policy analysis of the development of the National Health Insurance Scheme in Nigeria. Health Policy Plan 2015; 30(9): 1105-17. 10. Robinson HM, Hort K. Non-communicable diseases and health systems reform in low-and-middle-income countries. Pac Health Dialog 2012; 18(1): 179-90. 11. Bakare AS. Measuring the Income Inequality in Nigeria: the Lorenz Curve and Gini Co-efficient Approach. Am J Econ 2012; 2(1): 47-52. 12. Oni T, Unwin N. Why the communicable/non-communicable disease dichotomy is problematic for public health control strategies: implications of multimorbidity for health systems in an era of health transition. Int Health 2015; 7(6): 390-9. 13. Boutayeb A. The double burden of communicable and non-communicable diseases in developing countries. Trans R Soc Trop Med Hyg. 2006; 100(3): 191-9. 14. Amuna P, Zotor FB. Epidemiological and nutrition transition in developing countries: impact on human health and development. Proc Nutr Soc 2008; 67(1): 82-90. 15. John EU. The Impacts of User Fees on Health Services in Sub-Saharan African Countries: A Critical Analysis of the Evidence. Am J Pub Health Res 2013; 1(8): 196-202. 16. Abegunde D, Stanciole A. An estimation of the economic impact of chronic noncommunicable diseases in selected countries. A working paper. World Health Organization Department of Chronic Diseases and Health Promotion (CHP) http://www.who.int/chp. Accessed on the 18th December 2017. 17. Engelgau MM, Karan A, Mahal A. The Economic impact of Non-communicable Diseases on households in India. Global Health. 2012; 8: 9. doi.10.1186/1744-8603-8-9. 18. Temu F, Leonhardt M, Carter J, Thiam S. Integration of non-communicable diseases in health care: tackling the double burden of disease in African settings. Pan Afr Med J 2014; 18: 202. 19. Schofield D, Passey M, Percival R, Shrestha R, Callander E, Kelly S: Retiring early with cardiovascular disease - impact on individual’s financial assets. Int J Cardiol 2010; 92: 125–6. 20. Barrett AM, Colosia AD, Boye KS, Oyelowo O. Burden of Obesity: 10-year Review of the Literature on Costs in Nine Countries. Toronto, Canada: ISPOR 13th Annual International Meeting; 2008. 21. Langa KM, Fendrick AM, Chernew ME, Kabeto MU, Paisley KL, Hayman JA. Out-of-pocket health-care expenditures among older Americans with cancer. Value Health 2004; 7: 186–94. 22. Wang Q, Brenner S, Kalmus O, Banda HT, De Allegri M. The economic burden of chronic non-communicable diseases in rural Malawi: an observational study. BMC Health Serv Res 2016; 16: 457-60. 23. Jaspers L, Colpani V, Chaker L, van der Lee SJ, Muka T, Imo D, et al. The global impact of non-communicable diseases on households and impoverishments: a systematic review. Eur J Epidemiol 2015; 30(3): 163-88. 24. Maiyaki MB, Garbati MA. 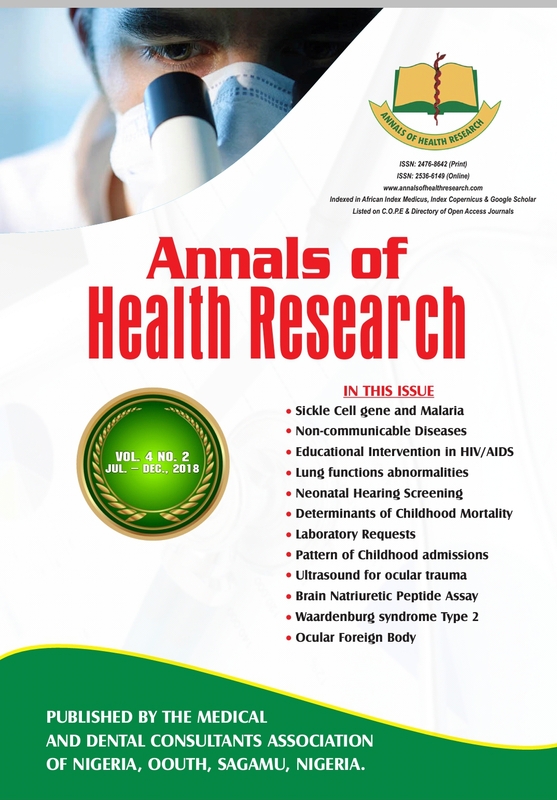 The burden of non-communicable diseases in Nigeria; in the context of globalization. Ann Afr Med 2014; 13(1): 1-10. 25. Janssens W, Goedecke J, de Bree GJ, Aderibigbe SA, Akande TM, Mesnard A. The financial burden of Non-communicable diseases in rural Nigeria: Wealth and gender heterogeneity in health care utilization and health expenditure. PLoS One. 2016; 11(11): e0166121. 26. Muka T, Imo D, Jaspers L, Colpani V, Chaker L, van der Lee SJ, et al. The global impact of non-communicable diseases on healthcare spending and national income: a systematic review. Eur J Epidemiol. 2015; 30(4): 251-77. 27. World Health Organization. Global burden of disease report, Nigeria available on http://www.healthdata.org/nigeria. Accessed 22nd January 2018. 28. Mensah GA. Tackling non-communicable diseases in Africa: Caveat Lector. Health Educ Behav 2016; 43(1): 7S-13S. 29. Amuyunzu-Nyamongo M, Owuor JO, Blanchard C. The consortium for NCD prevention and control in sub-Saharan Africa (CNCD-Africa): from concept to practice. Glob Health Promot. 2013; 20(4): 97-103.